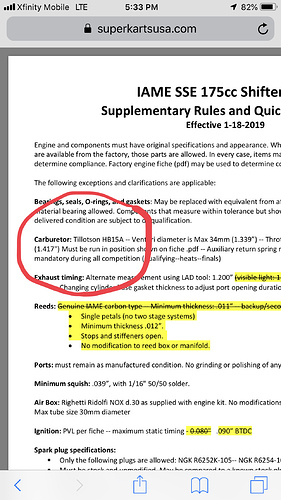 Notice from IAME regarding Tillotson HB-15A Carburetor Adjustment Screw identification. Thank you for posting this. I see a fair number of carbs come through my shop that have the screws reversed. 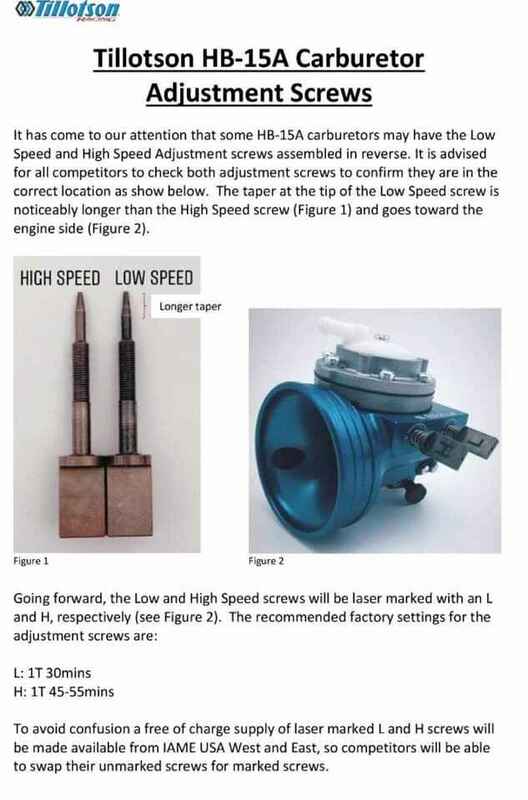 Older X30 (HW27A) carbs had the high speed screw marked with a tiny “H”, but newer units do not. I always engrave H and L on the screws of any carb I service. I put a note/picture on my website addressing this. I did this on mine the first year I ran it and wasted a few sessions trying to figure out why it wouldn’t run right. I just got our KA, so I will check it before we run this weekend. Except my KA100 came with an HW-33A carb. That’s the carb used in Australia I believe? @KartingIsLife The HW 33A is the currently used carb in Australia. HL 388A is the original that was supplied at the very beginning. I thought the US used the same as we do now. Wonder what the difference is. The HW 33A carb can have the mixture screws mismatched also, so worth a check. US is using the same carb now. My motor came directly from IAME USA West and has a release date of February 21, 2019. So it has to be what they are running now. I still checked, and they looked correct. Is this the 175 SSE carb?